To celebrate the May 20, 2013 Philippine premiere of the series “The ‘80s: The Time Of Our Lives,” National Geographic Channel threw a raucous ‘80s-themed party for members of the press, VIPs and their partners at Amber Ultra Lounge at The Fort Strip last May 7. Guests experienced a bit of time travel as they relived the ‘80s party scene in one of Metro Manila’s hottest 21st century clubs, totally transformed into an ‘80s disco just for the night. National Geographic Channel pulled out all the stops to turn Amber into a time machine by deking it out with mirror balls, slinkys and reinforced lights to recreate the ostentatious vibe prevalent in ‘80s clubs. A bit of playful camp added to the retro feel, with guests being greeted by the venue’s façade customized to resemble a Rubik’s Cube, one of the most popular toys that emerged in the 1980s. Every sight and sound gave partygoers the distinct feeling of being back in that memorable decade, and this is exactly the atmosphere that National Geographic had so meticulously planned for its special guests. The program fully embraced the fun “baduy” spirit of the 1980s, featuring a classic dance medley number set to unforgettable ‘80s hits. The host for the evening was none other than Philippine ‘80s icon JojoAlejar, who rose to fame as a regular cast member of the popular youth-oriented variety show “That’s Entertainment”. Deftly employing his stand-up comedy skills, he entertained partygoers with his wit while leading the night up to the party’s highlight, a special advanced viewing of “The ‘80s: The Time Of Our Lives,” a series that tackles the most significant events and people that marked the 1980s as a turning point in world history. 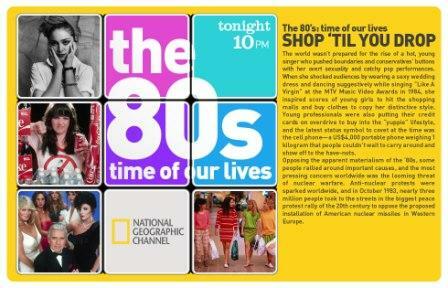 Premiering on the National Geographic Channel on May 20 at 10pm, “The ‘80s: The Time Of Our Lives” gathers and weaves together interviews from noteworthy personalities from the 1980s, including celebrities, innovators and media titans, to construct a collective narrative that shapes the biography of that revolutionary decade. Narrated by British actor Richard E. Grant, the series is a documentation of how people learned to live, work and play in completely new ways in the face of breakneck-speed innovation, glamor, success and ambition, which permeated the 1980s. It uses astonishing archiving and dramatic reconstruction to tell the story of the forces that rocked the world and determined our future.